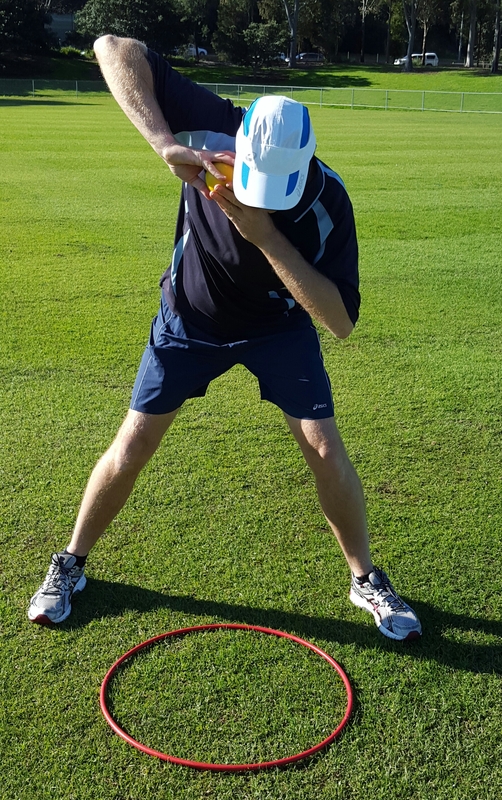 One of my favourite shot put drills to use when coaching young athletes is what I call the “shot put slam”: This simple drill has proven more effective for me than any other in assisting young athletes to learn how to drive the shot away from the neck and propel it off the fingers. Hold a soft training shot next to the jaw or under the chin using the correct grip. The elbow of the throwing arm is held high and out to the side. The hand of the non-throwing arm can be placed under the shot for support. Lean over a hoop that is placed on the ground. The feet are placed either side of the hoop. Take the supporting hand away from underneath the shot. Push or “slam” the shot down towards the middle of the hoop, keeping the elbow of the throwing arm up and out to the side during the movement. The Shot Put Slam Finishing Position. Finish with a full follow-through. The throwing arm, wrist and fingers should be fully extended. The athlete should feel the shot propel off their fingers. “Stretch” their throwing arm and fingers fully towards the ground. Try to “bury” the shot in the ground. Pretend that their shot is a “meteor crashing into the desert”. Keep their elbow up and above the shot as they push. Keep their elbow away from their side. Use soft training shots in preference to the real thing in case of a misdirected push. 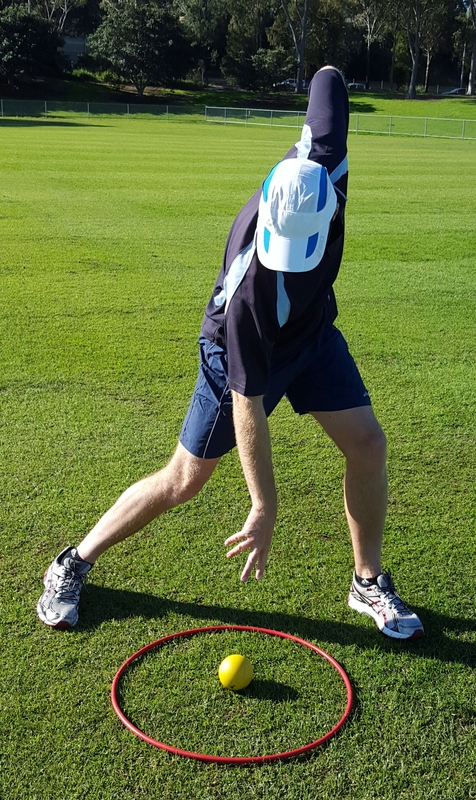 Use a hoop on the ground as a target and also to keep the athlete’s feet out of the way. Let me know how you go using this drill! 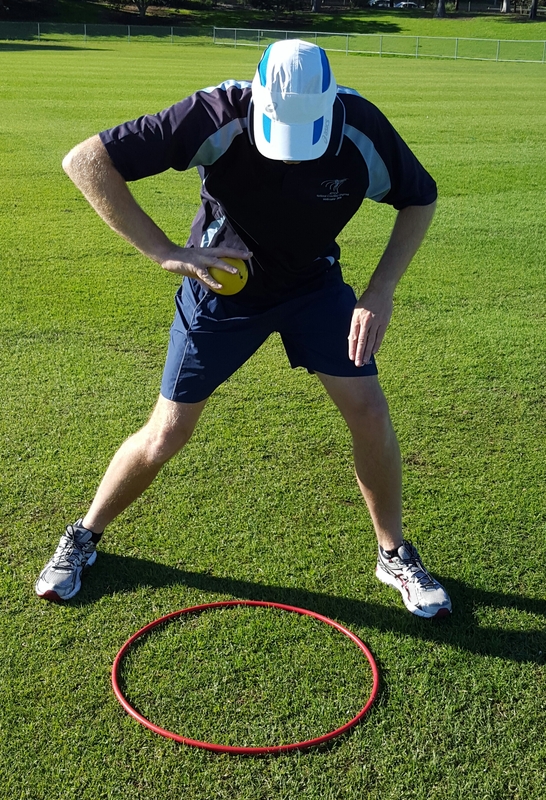 I would love to hear feedback from those of you who try this drill with young athletes. Let me know how it goes. I am also happy to answer any questions about it. 5 Posts That Will Help You Teach Shot Put.